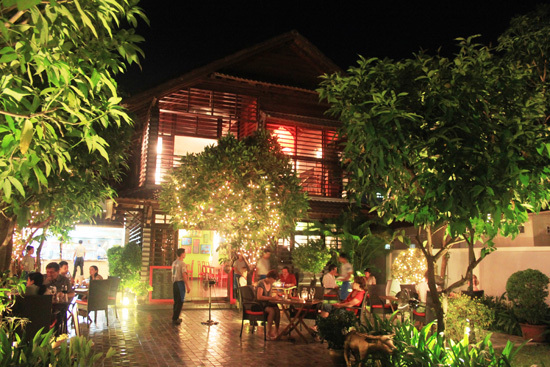 Run by Kaliyan Mith, an NGO working with street children in Siem Reap, Marum makes dining for a worthy cause something to savour. Sitting in a similar category of quality cuisine to the delightful and always busy Haven training school restaurant, Marum raises the bar slightly with regards to both ambiance and price point. Though it has been set up to cater primarily to tourists, Marum is not found in the main throng of Siem Reap’s tourist stomping grounds but rather just beside Wat Polanka pagoda, a short 10-minute tuk tuk ride from the Old Market area. A somewhat unexpected traditional wooden villa awaits. With gardens and an outdoor patio seating area it seems like you’ve stumbled across a rather sumptuous private home. Trees are draped with fairy lights and Marum is illuminated, an enchanting first impression best felt at night, although the restaurant opens at 11:00 for lunch. Lit up trees at Marum, named after the Moringa or ‘Tree of Life’. Marum is the fifth training restaurant established by Kaliyann Mith and carries on the creative traditions with tapas-style dishes serving up some of the best local flavours with a twist. If you can’t contemplate the idea of sharing, a short selection of ‘Bigger Dishes’ starting at US$5.75 may entice instead. By choosing a selection from their broad range of small plates you can brave the red ant tree fritters with prahok dip ($3.75) without having to commit fully to something quite so exotic. Should you need retreat to a more comforting and familiar palate, you can always sample items such as barbecue pork spare ribs with apple and radish salad ($5.50). Classic Khmer fare is played around with a contemporary take. When a typical smoked fish and green mango salad arrived the Cambodian in the group didn’t initially recognise this culinary staple. This Asian-fusion style also sees the typical amok curry reinvented in the form of steamed seafood dim sum drizzled with amok sauce ($5.75), which can be enjoyed with the particularly tasty fruit shakes and freezes – passionfruit and sugar cane, yes please. If this kind of original food appeals, do make sure you also pencil in a visit over at Cuisine Wat Damnak for a fine-dining experience, with its weekly changing set-menu using fresh seasonal produce. As you’d expect with tapas, the portion sizes are relatively small, so you do need to order several to share, making this not a low-budget Siem Reap option — but neither is it excessively pricey. The service we’ve experienced has been inconsistent, even with Teacher & Student clearly printed on staff uniforms, but given that this is a training school restaurant and social enterprise it is easy to forgive the occasional nerves. On site in the separate neighbouring building is the Friends International NGO shop, so as you wait for dessert check out the silver spoons reshaped into funky earrings, bags and other nik-naks or their colourful cook books should you feel inspired to get creative in the kitchen yourself.